Home > Subwoofer Boxes > Loaded Subwoofer Boxes > Dual 12"
. Constructed with strength and stability in mind, these sub boxes produce powerful bass tones you never expect. These Sub Boxes are extremely rigid, yet lightweight, for low distortion and powerful bass at high sound press levels. 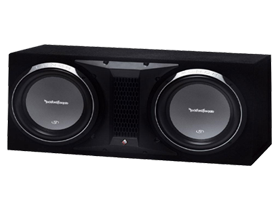 With Dual 12" Loaded Subwoofer Boxes that takes up minimum amount of space in the boot or virtually disappears under a seat, its performance punch is an attention grabber! Have one installed now!